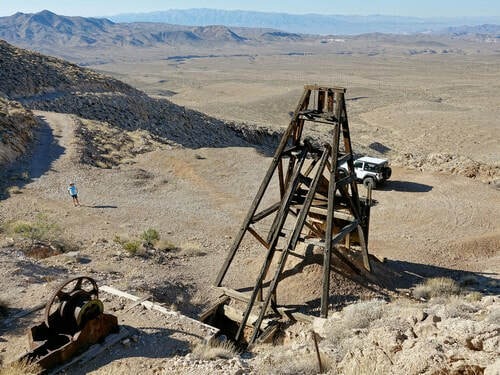 Visit 3 lead mine groups above Noonday Camp, drive by old talc mines and go down Sperry Wash to Dumont Dunes. 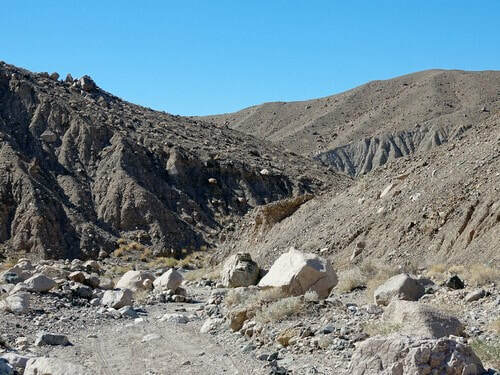 This track starts south of Shoshone then goes through Tecopa to old lead mines abandoned in 1957. 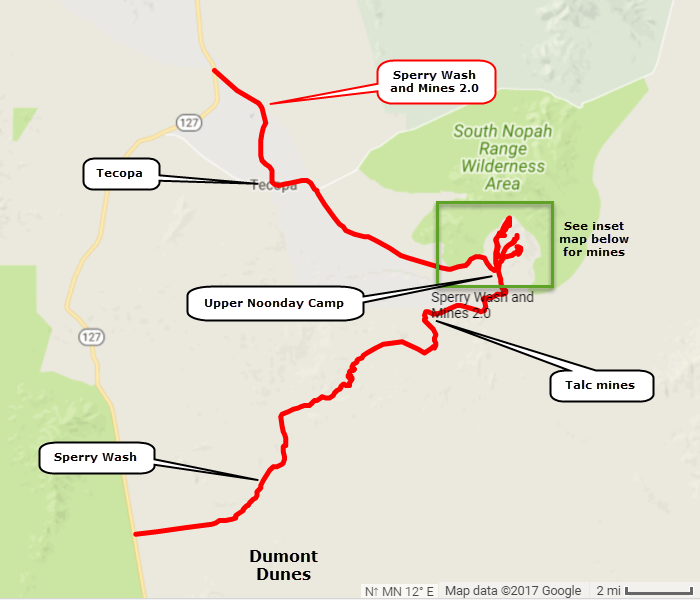 It continues past talc mines and drops down through Sperry Wash, ending at Dumont Dunes. ​We ran from north to south but it can be done in either direction. We started this trail off Highway 127 a few miles south of Shoshone. 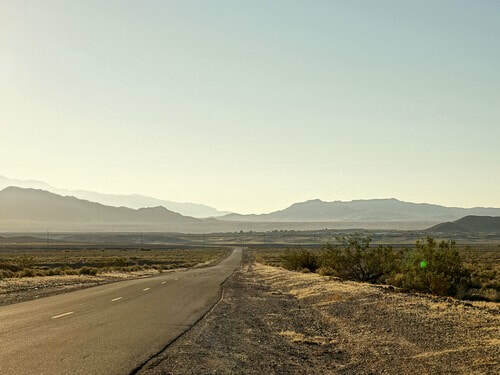 The road is paved from the Highway until a few miles beyond Tecopa. Soon after the pavement ends you will come to the remains of Upper Noonday Camp. The Finley Company built the town in the 1940s to support the nearby Columbia, Noonday and War Eagle lead mines. It was later used by the Anaconda Copper Company, who constructed a lead ore concentration mill during 1947–1948. 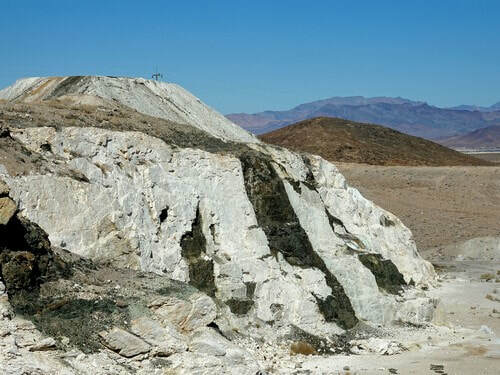 Lead mining ended in 1957 when the U.S. government reached its strategic stockpile goal. Foundations of the supervisors and guest houses, several slabs that supported the kitchen, boarding house, and bunkhouses are evident, along with a lot of debris. Prominent is the cinder block vault that held the script currency the miners could use at the company commissary. 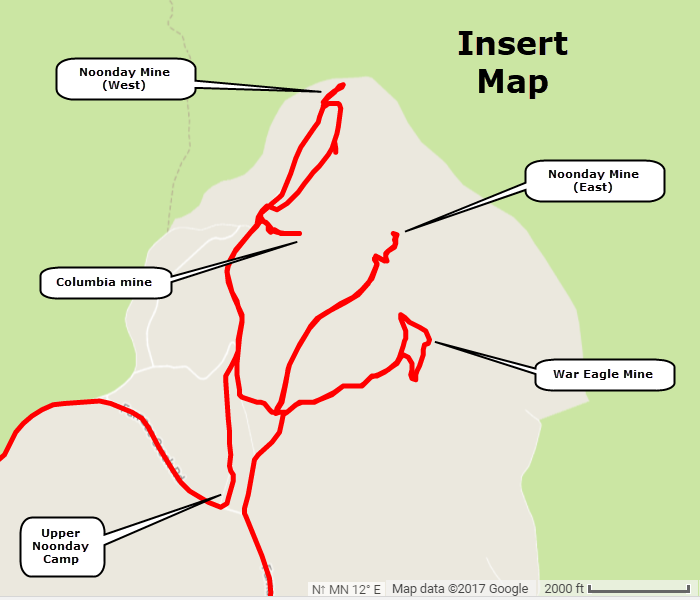 This track visits all three mines mentioned above. 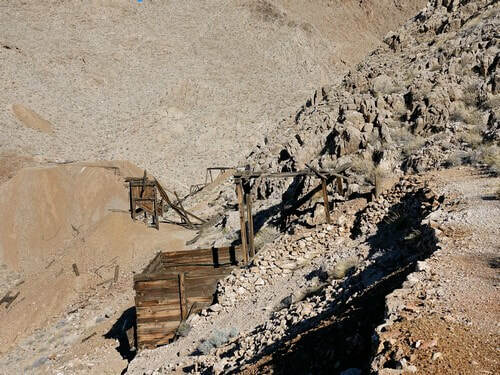 Drive a narrow road out to a loading ramp and open mine shaft at the Columbia Mine. 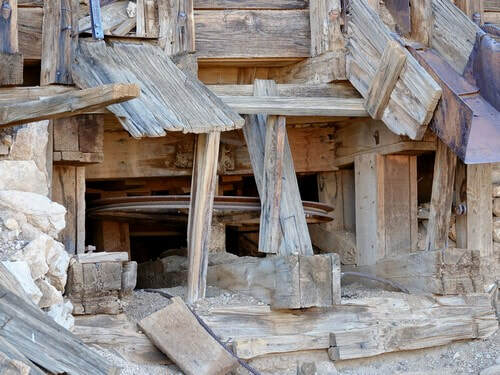 One series of roads explores the west side shafts of the Noonday Mine and another explores the east side. It appears there was a vertical surface vein as well as an underground one in this location on the west side. There is a large structure that loaded ore onto cable cars that were lowered down a ramp to road level. The cable pulley still remains. Someone has made a walkway over a vertical shaft so they could reach the horizontal shaft. Hope it is solid and hope you have good balance if you use it. 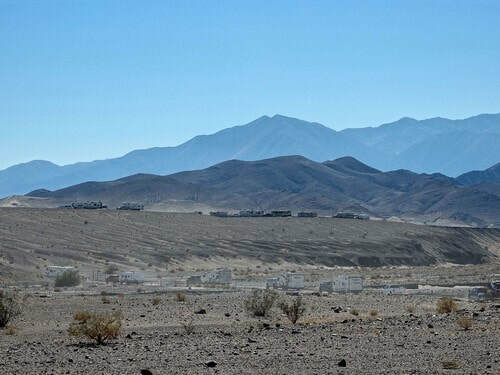 War Eagle is the third mine behind Upper Noonday Camp. 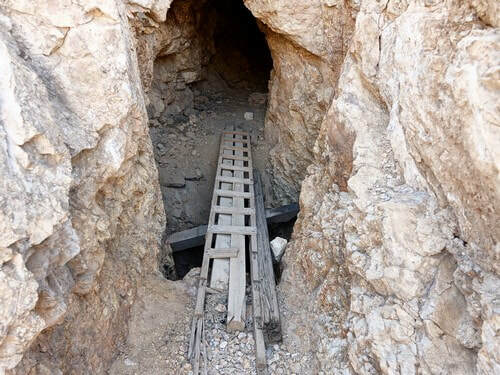 Go back to the main trail and continue until you come to a series of abandoned talc mines. The mines were closed in 1972 when talc went out of favor because of asbestos content. This industrial grade talc did contain asbestos and silica. Cosmetic grade talc (supposedly) has been processed and treated so it does not contain these contaminants. Continue southwest on the main track. You will discover that this road was paved at one time. 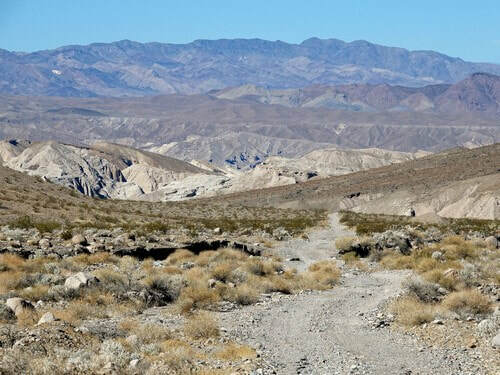 Drop down through Sperry Wash, the namesake feature of this trail. Both sides of the trail are in Wilderness so be sure to stay on the road. 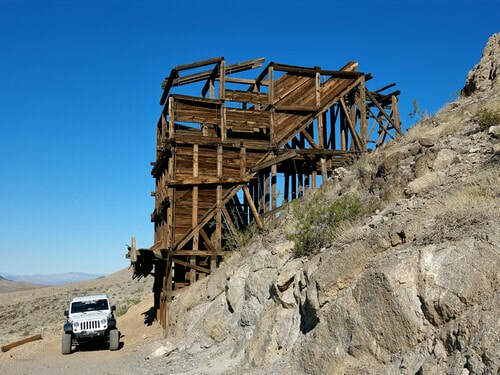 You will see evidence of the Tonopah and Tidewater Railroad, built in 1906-1907. 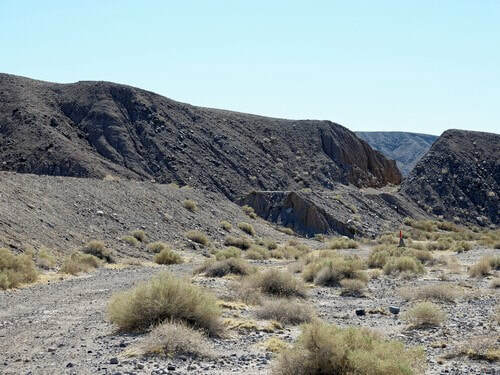 There were three trestles, several long cuts, and compacted fill slopes as the railroad ascended from Dumont to Tecopa. One of the trestles was over 500’ long. 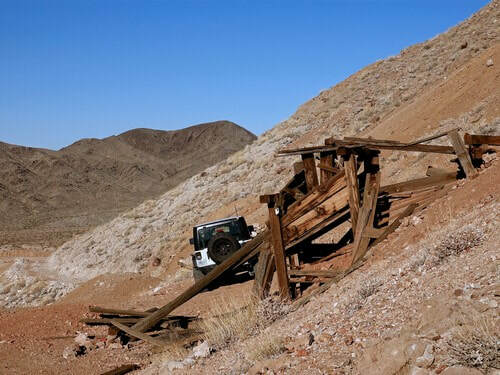 In order to reduce the steep grade and at the same time avoid the bed of the Amargosa River, the railroad crossed and recrossed the canyon several times. 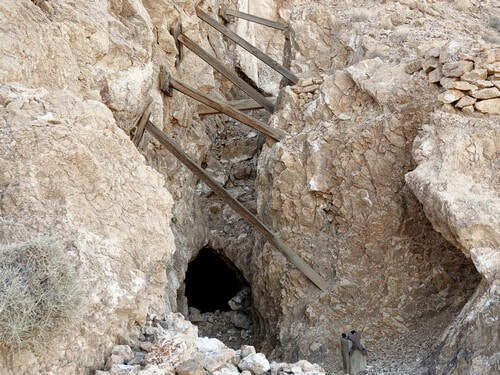 In 1910 a spur was constructed to Noonday Mines. ​In March 1938, the T&T was severely damaged by floods from heavy rains. An application to cease operations was officially registered with the Interstate Commerce Commission in December 1938 and on June 14, 1940, all operations on the T&T ceased. The War Department requisitioned the line and all its scrap iron in 1942. On July 18, 1942, contractors began removing the rails at Beatty and worked southward, using the line one last time to haul the iron. Ludlow was reached on July 25, 1943, closing a final chapter to the history of this great railroad. 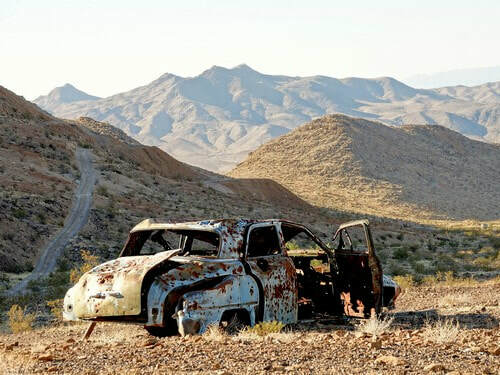 ​This Sperry Wash trail actually ends on a major gravel road leading to Dumont Dunes. We were there just before a big weekend and there were a zillion RVs on their way in, and another zillion already there.